Martin Butler expresses his fascination for lovers‘ tendency to develop the same habits, make the same gestures, have the same way of dressing and tal­king. Mirrorwise. On stage a number of framed transparent screens on wheels are, of course, functioning as mirrors. 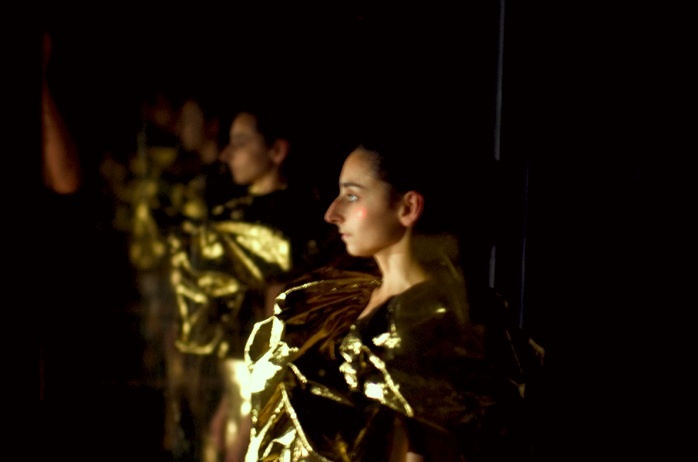 The dancers Mariangela Tinelli and Gaia Gonnelli are dressed in shiny, skin-tight costumes. While one of them studies herself in the mirror, coquettish and vain, the other places more mirrors around her. 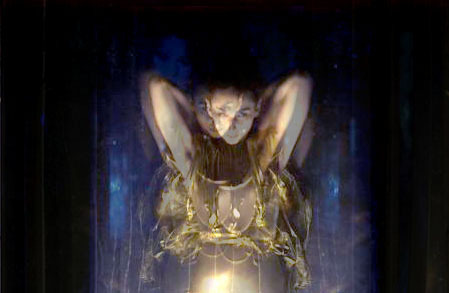 Tinelli starts to move slowly, intensely watching her reflected image, opening a series of scenes marked by chapter numbers until the see-through mirrors are arranged in a line. They move towards the glass wall and study each other, moving synchronically as if they were looking at their own image in the mirror. The real and the double.